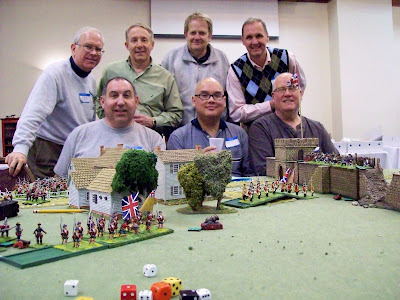 On April 5-6, 2013 The Seven Years' War Association held its annual wargame weekend at the Magnuson Hotel in South Bend, Indiana USA. I arrived Thursday evening to have dinner, chat and catch up with friends. Games were held on Friday and Saturday allowing an easy drive home Sunday. 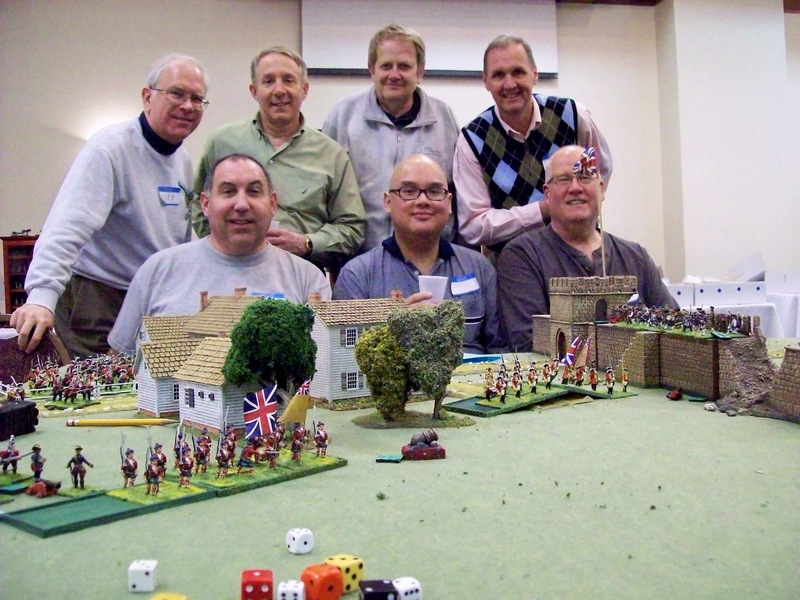 Just under one hundred people attended to game the mid-18th Century featuring North America, India, Europe and the ocean blue. The celebrated Christopher Duffy spoke Saturday and there were a number of good vendors. 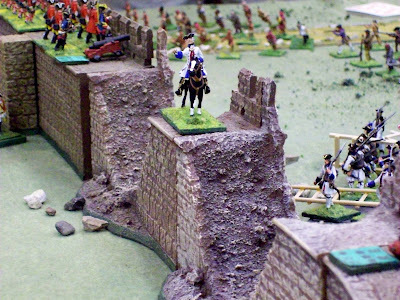 In April 1760 the French Army left Montreal to recapture Quebec. The British formed to oppose General Levis a couple miles to the west of the city at Sainte Foy. 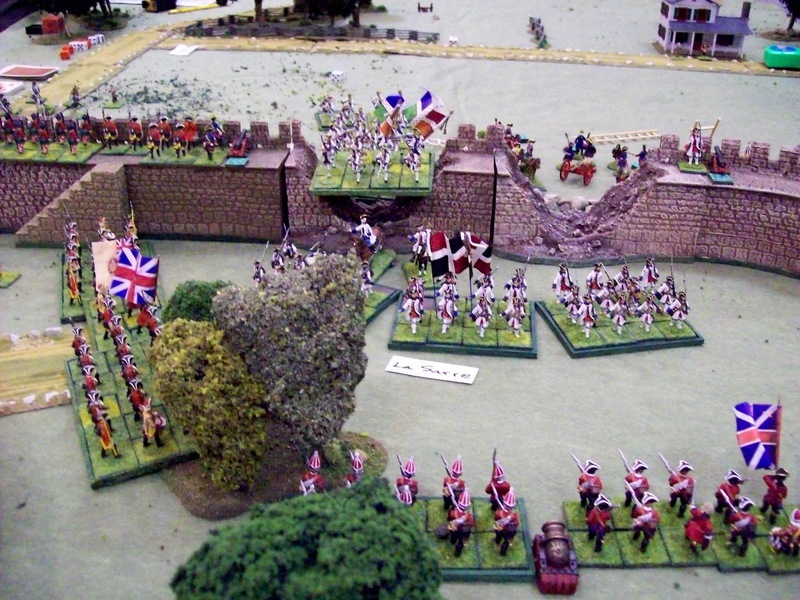 The French won the battle and the British retreated behind the walls of Quebec. 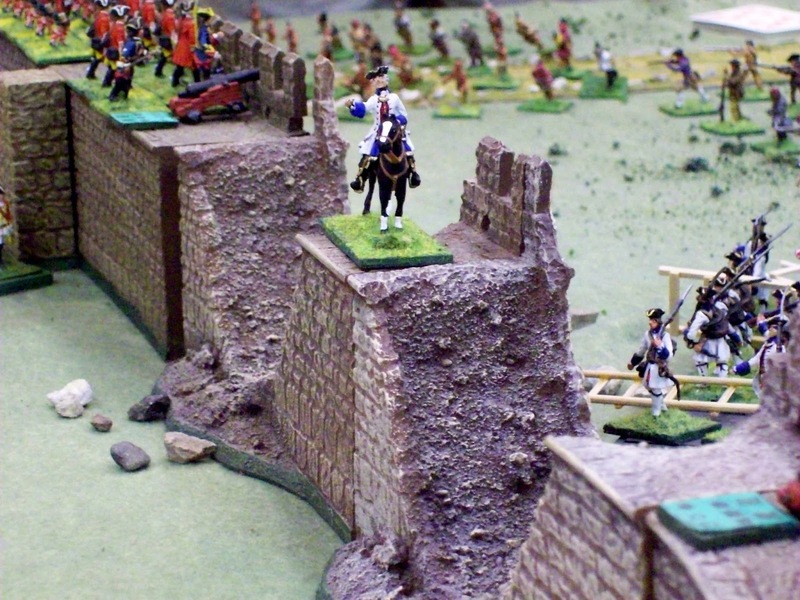 Afterwards the French laid siege to Quebec hampered by insufficient artillery though it was said walls were weak. Murray's British garrison was sickly and low on supplies. A waiting game ensued as the frozen St. Lawrence River thawed. Quebec would ultimately be controlled pending the arrival of the Royal Navy or not. 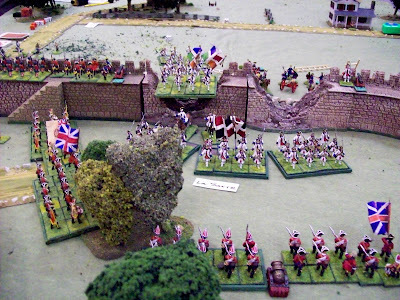 Historically the British arrived to resupply and save the garrison. 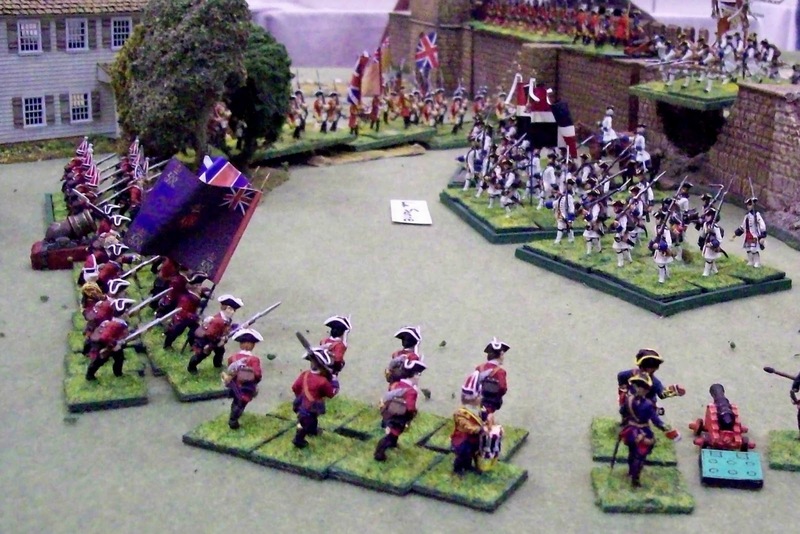 Not wanting to storm the walls after this, the French retreated back to Montreal. 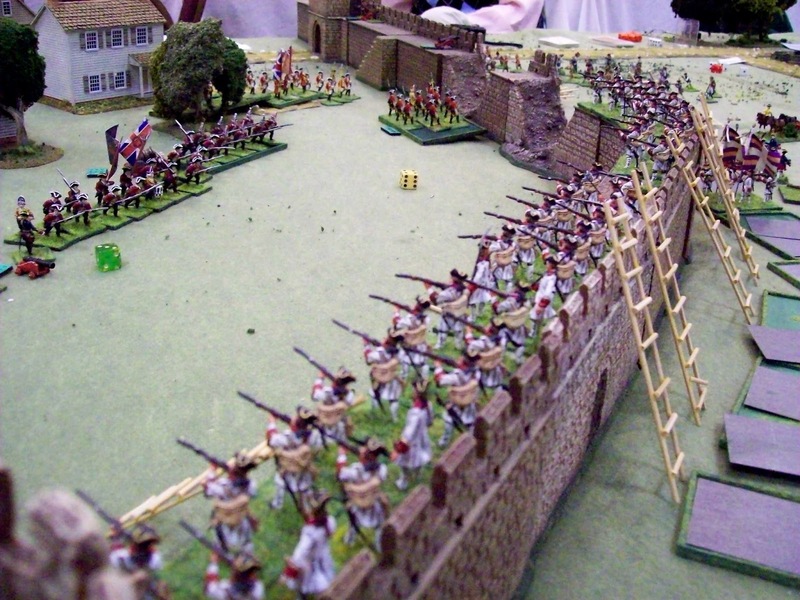 After which the French formed up, gathered ladders and prepared to storm the city. One example was Battalion 2/La Sarre initially formed in open column of divisions before it marched toward the wall. In the distance from left to right Canadian milice with battalions 2/Royal Roussillon, 2/ La Sarre and 2/Berry come closer. The 60th Royal Americans wait inside the walls to fire devastating volleys as the French come through the two breaches. 2/Berry arrives at the wall and is about to raise scaling ladders. 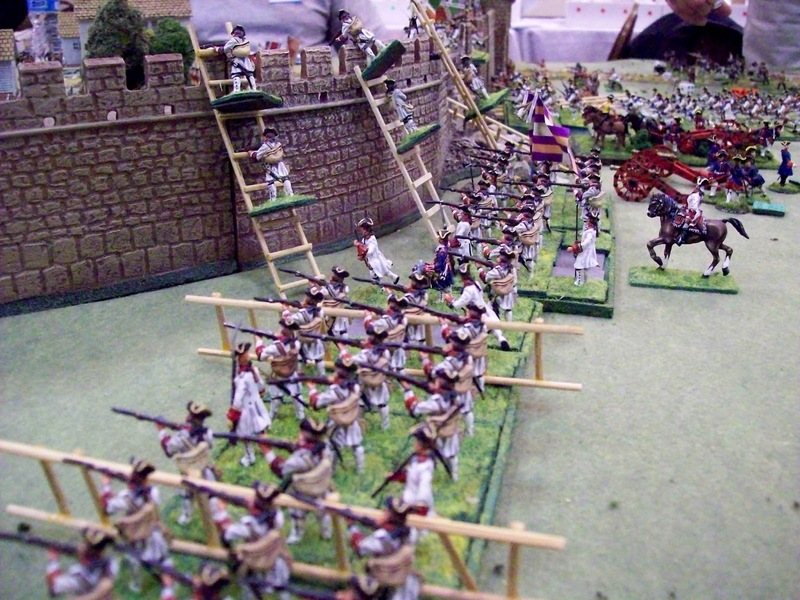 Ladders were scratch-built from bass wood and Elmer's wood glue. They were made wide and rungs were separated enough so miniatures could be easily placed on them for a fun old school look and feel. 2/La Sarre came through the breach first, becoming disorganized as it climbed over rubble. A semi-circle of British Brown Bess muskets met them and La Sarre routed back through the gap never to return. Behind La Sarre 2/Royal Roussillon is just about through the breach. 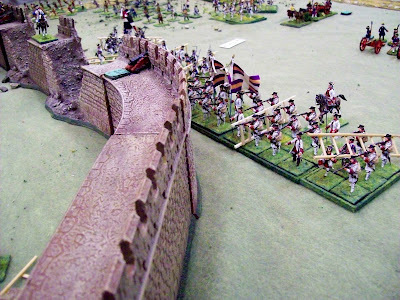 The 44th Foot mans the wall on the left versus Canadian milice and brave Woodland Indian allies on the other side of the wall. 2/Royal Roussillon routed to the rear when it was charged by a division of the 44th Foot shown at the top middle of the image. Meanwhile 2/Berry climbed onto the wall mostly unopposed, closed up taking its time to get into formed close order and prepared to fire. Not shown is the 42nd Highland battalion marching to assist the British right flank. It had been posted to the left of the main gate taking on the Woodland Indians. Soon General Murray asked for terms. General de Levis granted them and the battle ended. Quebec was restored to France. Left to right standing: Yours truly Bill P., Paul Q., Rolf R. and Chris C. Seated are Brad C., Noel V. and Brent O. Chris brought an adult beverage to toast our companionable players. (Let me know if I have any one's name mixed up) Thank you VERY much for participating! 1) Paul, Rolf, Chris, Brad, Noel and Brent - if you want to make comments, please do at remarks below. 2) Noel did extreme execution with the huge mortar in the middle of the image above. 3) I do believe we all had a lot of fun. The game had an old school appeal about it because of the big battalions, bombardment, collapsing walls and scaling ladders. 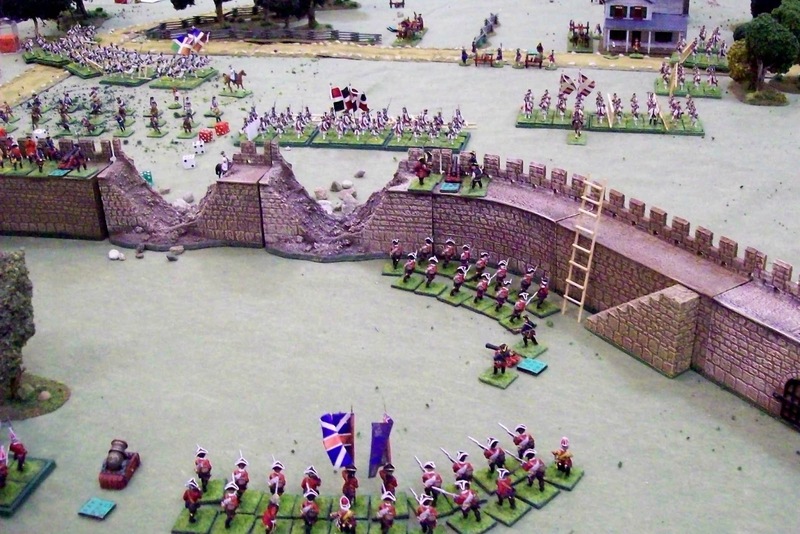 4) Rules: Batailles de l' Ancien Régime 1740-1763 known as BAR. The game was played in three hours. 5) Thank you Der Alte Fritz (Jim P.) who provided all terrain except for the walls. 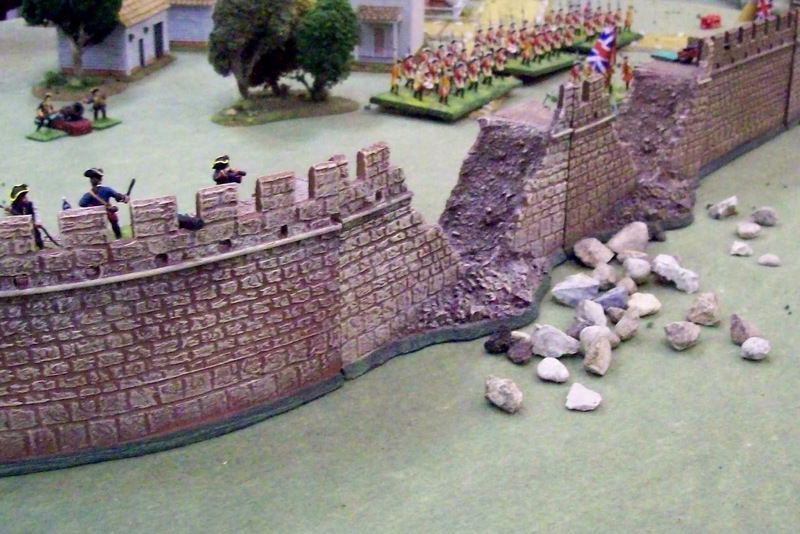 6) We had additional fun when Brent had the commander of 2/La Sarre charge through breach rubble up onto the rampart to point the way through the breach! 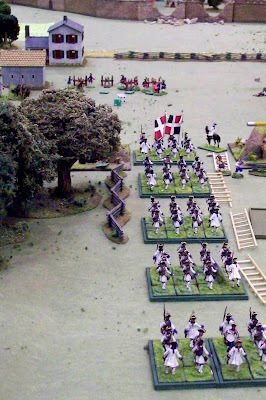 7) All French white coats are 30mm Willies, the 44th Foot is 30mm Stadden, the Royal Americans are Front Rank. 8) Your remarks are welcome below!